These kids are so crazy and I love them so much. She thanks you for everything from brushing her hair to changing her pull-up to tying her shoe. She is so encouraging. We climbed a hill recently and she told me how good I did. "Good job Mommy". "Good clapping Mommy". "Good Cleaning Mommy". "Good hit Boy". A bit bossy: "Go get it Mommy"..."You go get it". "Boy, be careful". "Daddy, don't you yell at that Boy"
Boy is hilarious and so serious about things. "Mommy, A Vark Vader helmet will fit my head so good"
He loves to be in costume. Whether is is Micky ears, head to toe Lightning McQueen, Superman, Batman, Iron Man, Thor, Captain America, Transformers (which he calls Iron Giant), "Baseball Man" (when he is playing ball). He says "Mommy, I am going to play quietly in my room, don't turn that light off"
Bluebird has developed a love for the pool and splashes and laughs. She also loves the piano. She stands underneath and stretches up and plays and plays. well, these types of things happen all the time. She knows right where your keys or cell phone is. She know the contents of drawers that are supposed to be child proof. Boy lost his Mickey ears recently (yes, he started wearing Mickey Mouse ears, another story but what sweet innocence)- after naptime he couldn't find them anywhere. We looked upstairs, downstairs, garage, back porch, bathroom...finally I asked Bluebird "Have you seen Boy's Mickey hat?". She looked perplexed, then started babbling and then opened a closet door and pointed to the ground, where low and behold, lay the ears. I am still unclear if she actually put them there or if it was just noted in her mind where she saw them last. This morning, I showered and heard her nosing through my things. As I was getting ready, I didn't see my glasses. I did not even bother to look. I just said "Bluebird, where are my glasses?". She walked in babbling away and went to a table and said "here Mommy". BUT- she also threw two other small items my way. I just heard them bounce off the floor. I said "What else did you have?" Her reply: "your rings, Mommy". Yes, my wedding rings, that I had not yet found missing, now rolling under the bed. Wow, thank goodness she keeps note of where she places things. As most of you may recall, I decided to give my little china cabinet a makeover. It's been a long time coming. This cabinet was my great grandmother's. An antique. However, my great grandmother was just a country lady and so this wasn't a "fine" cabinet...but it is functional and special because it was hers. I have had it since I was in high school. I just slowly watched it fall apart, scared to do anything to it because I didn't want to ruin it with some flighty idea. 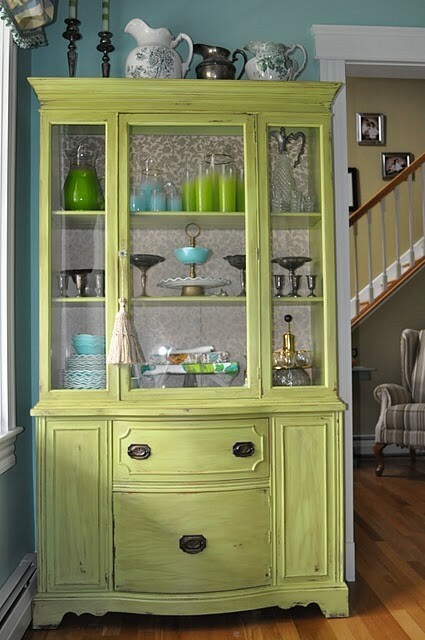 I liked that it gave me a way to paint the cabinet but still make it look old. So...we set off on our task. It took us two weekends to complete because we had to use wood filler and sand and lots of tacking of old lifted panels. The antiquing glaze may still be a little in the making because the wood took it better in some places than others. I added some molding, two little flowers we actually had laying around in the garage....Daddy picked out the fabric backing...which at first I thought might be a little too "retro"...but turns out, it is lovely with the little molded flower additions. the only thing left to do is find the perfect handles...I had to wood fill the previous holes because it is so hard to find handles with a 4" spread. Standard is 3" these days. I didn't take a photo, but the drawer is lined with the fabric as well. I never knew Georgia (my great grandmother)...she died before my mom was born...But, something tells me she would like this too. Buttercup: 10 months old. She has 6 teeth, but her two top front middle teeth are coming in a bit after her two top canines...our little snaggle tooth. She just started clapping on her own. I don't even think we remembered to teach her...and she just figured it out and started clapping. Also, when we ask her where her Daddy is, she puts her arm out and leans towards him in a type of 10 month point. She doesn't do that for me...but when I am home, she clings to me and if anyone comes too close, she smiles, but nuzzles her head into me to let them know she isn't going anywhere. She doesn't sleep through the night...but gets closer, sometimes. Her hair is getting blonder and seems straight like Boy's. Her eyes are a crystal blue.She stands for a few moments on her own, and it is so cute to watch her elan into the toy box to check things out. Boy: 4 years and 3 months old. He goes from super hero to Cars to trains.I love listening to him reason and talk through things. He tells Daddy "You're the guy, You're the one". He knows what all his letters look like and what sound they make. He knows what letter all his friends names start with. He is still shy and quiet, but he pays close attention to those details. He always talks about his "Grandpa"..."My Grandpa will be so proud of me", "My grandpa's name is Crazy Pa". In baseball, he really just wants to goof off with the other kids...and tends to gravitate towards all the negative behaviors. He thinks they are hilarious. He doesn't sleep through the night either. He always makes it into our bed and by my side at some point. He loves to sing but really only does it for me. I feel blessed to know these little sides of him he won't show anyone else. If he gets hurt, he says "I don't need a band-aid"...he doesn't like his hair cut either, but he will say "Mama, you can cut my bangs and then take me to the store" (letting me know he can be bribed)...he is a bit spoiled and when we drive past Target he says "There is my store, that's where my toys are". Bluebird: 2 years 10 months old. She is completely potty trained...except she doesn't want to poop in the potty, instead she walks upstairs and puts a pull up on. She is so smart that we are constantly stunned. She is becoming more dramatic, but mainly when I am around. She still sits on the counter in the sink while I get ready for work in the morning. She has ruined two baby dolls wit markers and pens...one of which was my baby as a child. She just likes to "color". She is funny and knows way more about super heroes and cars and trains than any little girl should. She can hang with the big kids. She likes to swing high, run fast and get dirty. But she still swirls in a new dress and loves her pedicures. She has No fear and we are constantly working to keep her safe...a challenge. She also loves babies and at night she covers herself with everything she owns. She is generous with hugs and kisses and kind words. She usually sleeps all night in her own bed, but when she does come into our bed, she brings along about 3 blankies and all the stuffed animals she can carry. Her smile is so big that it takes up half her head when she laughs. Her eyes are the color of the ocean after a storm, a kind of dark teal. She is full of encouraging words and is constantly telling boy that he is a super hero, or good baseball player. She loves Boy. Daddy threw a toy in her direction earlier in order to move it out of the kitchen and she said "Daddy, good throw". She likes to play on the stairs and all too often there is a whole little set up right on the stairs of kitchen stuff or cars or other toys. My cousin is staying with us and she found a few toys randomly selected on the hood of her truck, compliments of Bluebird. These are uncertain times, for sure...but today, I feel blessed to be free. Freedom of speech. Freedom of religion. Free to pursue dreams and live the life you want. Ok folks, I got my blue piano. I have been thinking about this for a while...and it finally happened. It was not as simple as I had anticipated, however. 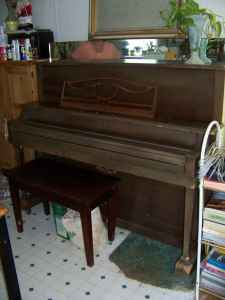 I looked for a deal and I got my $50 piano...but then I actually agreed to pay $100 over the asking price to get some help moving the thing. Again, I made this craigslist deal, site unseen...and of course, we get there to find this lady who was down on her luck, laid off...and, well...she lived in a trailer that reeked of urine. Literally would take your breath away. The floor was falling apart as we moved the piano and she admittedly didn't think the thing had been tuned since she got it (when she was 7 years old). As usual, I felt bad and didn't renege on the deal, even though it was quite clear that this piano would take a lot more work than we had anticipated. It would actually get worse when we got it home and found that it had obviously been housing a mouse family...and fortunately, no permanent damage seemed to be done. Still gross and a whole lot of cleaning and dusting. I had one sleepless night...thinking about all the better pianos I could have bought with the money I had now invested in this one. The piano is actually a Mehler, which is supposedly one of the better than average brands...however, this one needed far more work. Someone had butchered the top of it and put this weird mirror (you can see this in first photo below if you look closely- I didn't get this in before and afters because Daddy removed it almost immediately. It would need wood work, polish and a lot of tuning (which we will wait to do in the fall). Finally, this evening...it all came together at last. We are actually quite pleased. This has been one of our more tedious, but also one of our most interesting and beautiful restorations.